If you are new to the world of ordering food delivery online, you may be surprised by just how much the booming industry has grown over the years. With a number of food delivery services available to you, your choices of where to order food from are almost endless. In fact, many restaurants offer food delivery simply because of the fact that many of their competitors are doing the same. Failing to do otherwise would simply be detrimental to their business. However, if you still aren’t sold on the idea of online food delivery, today’s article was written specifically for you, where we will be discussing just a few of the countless reasons why individuals choose to order food online. At Restaurant Connection, we are Michigan’s best food delivery service with meals delivered directly to your door. We serve a number of areas throughout Michigan including Warren, Southfield, Novi, Utica, Sterling Heights, Auburn Hills, Rochester, and a number of other surrounding areas. As the leaders in takeout delivery, we know that you are looking for fast, convenient service. That’s why we make it easy for you to place your food delivery order online with ease! 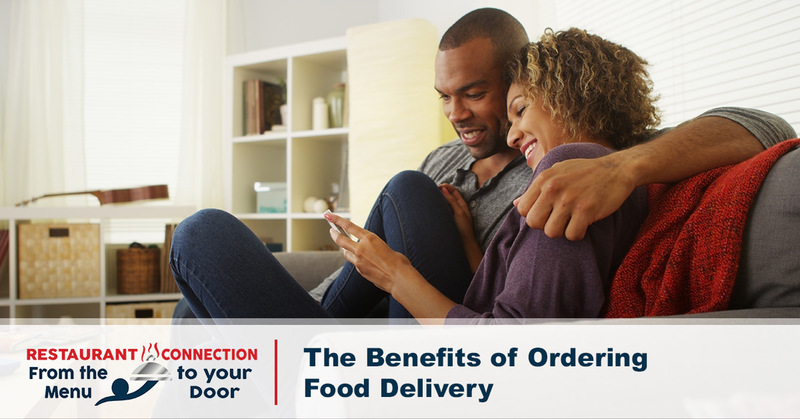 If you are considering ordering takeout delivery, but you would first like to learn more about the many benefits of food delivered to your door, read on to learn more. Whether ordering in a restaurant, or ordering over the phone, there are many times where your order can be taken incorrectly, leading to you receiving a dish that doesn’t truly fulfill your wants and needs. Erroneous orders can be incredibly frustrating, especially if you are looking forward to biting into a warm, succulent meal. However, with online food delivery, you can place accurate orders each and every time with ease. Since placing food orders online requires you to make precise selections on your own, there is no room for error when it comes time to pay for your food delivery order. For this reason, if you are concerned about receiving an incorrect order while at a restaurant or ordering over the phone, consider using our online food delivery selection tool today! There may be times when you don’t feel like going out to pick up takeout. Worse yet, you may have prior obligations that limit your ability to visit a restaurant to pick up your takeout order. If this is the case, then you will love all that our convenient online food delivery service has to offer. By using Restaurant Connection’s online food delivery tool, you can order takeout delivery whenever and wherever, so that you don’t have to worry about going without a delicious meal for an extended period of time. Whether you are at a sports watch party with your friends, or you simply have to stay late at work, Restaurant Connection has you covered. It can be incredibly difficult to find a restaurant in your area that has exactly what you are looking for. This can cause you to drive through town aimlessly, until you find a restaurant that truly satisfies your appetite. Not only does this waste time while you look for the perfect food location, it can also cause you undue frustration, leading to a meal that leaves much to be desired. With Restaurant Connection, you can choose from the widest selection of restaurants that deliver in Michigan with just a few simple clicks. In fact, our online food delivery service currently offers over 200 restaurants to choose from, offering a wide assortment of takeout options to choose from. One of the most inconvenient aspects of dining at a restaurant is that you have to carve out a select time of day to sit down and wait for your food to arrive at your table. This can turn what should be a 30-minute dining experience into well over an hour of commuting and eating. If you would rather not be burdened by the inconveniences of traditional dining, consider using Restaurant Connection’s online food delivery service today. With just a few easy clicks, you can have food brought straight to your doorstep while you take care of everyday priorities around your home. In fact, when asking individuals why they choose to use a takeout delivery service, many of these people will often list convenience as one of the biggest reasons for ordering takeout food online. When ordering at a traditional restaurant, guests are often left waiting for their food to arrive to their table, which can cause time to drag on at a snail’s pace. Worse yet, you may arrive at your favorite restaurant, only to realize that there are no available tables, resulting in unforeseen wait times and slow service. This is one of the many reasons why so many individuals are beginning to use Restaurant Connection’s online food delivery service. Gone are the days of dining at noisy, overcrowded, and inefficient restaurants. With Restaurant Connection, you can place your online takeout order with ease, and you won’t have to worry about not being able to be seated. Instead of subjecting yourself to the pitfalls of traditional dining, try Restaurant Connection’s online food delivery service today! These are just a few of the many reasons why individuals throughout Michigan pick Restaurant Connection as their restaurant delivery service of choice. Instead of spending excess time waiting for your food at a crowded restaurant, consider ordering food online today! We make it extremely easy to find the best takeout food in your area, and we offer a useful filtering tool on our website that allows users to select the style of cuisine that they want, based on their current culinary cravings! Not to mention, if you are planning a much larger corporate event or family gathering, the professionals at Restaurant Connection even offer premium catering services. To learn more, get in touch with our team of friendly individuals at Restaurant Connection today. We look forward to hearing from you!